Xi3 Corporation is now accepting pre-orders for their Piston Console, a cube-shaped PC built using modular construction. Perhaps more importantly, however, it’s the same system that Value’s upcoming Steam Box is based on. The company has set a pre-order price of $999 on the console although if you order between now and the end of SXSW on March 17, Xi3 will knock $100 off the price tag. Update (3/12): On a recent statement to Eurogamer, Valve's Doug Lombardi said his company and Xi3 are no actively working on the upcoming Steam Box, but that they did work last year on a preliminary basis: "Valve began some exploratory work with Xi3 last year, but currently has no involvement in any product of theirs." 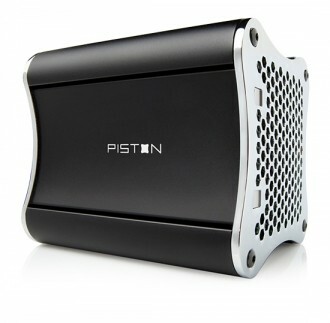 Founder, president and CEO of Xi3 Corporation Jason A. Sullivan said that given the amount of awards, media attention and gamer interest that the Piston Console has garnered since it was unveiled at CES 2013, his company is seriously becoming concerned that they might not be able to meet demand for the system this year. As such, they decided to begin accepting pre-orders at the start of the SXSW Gaming Expo. As an aside, the Piston Console was on display at SXSW this past weekend. If you happened to be in the Austin, Texas area, you could have stopped by the event to be one of the first to see the system in action. So, what exactly do you get for your investment? At this point, we know the Piston Console includes a 3.2GHz quad-core processor, 8GB of RAM and a 128GB. Other key specifications like the GPU have not yet been revealed – perhaps a tough sell if you aren’t willing to disclose the system’s full specs. We are told that users can upgrade to a 256GB SSD for $340 more or a 512GB drive for an extra $750.